SOFIA, Bulgaria, (BulgarianMilitary.com)– Bulgaria is about to pay three times the maximum estimated cost initially planned in the tender for the repair of the 14 Su-25 aircraft, learned BulgarianMilitary.com. This happened after a decision of the Bulgarian Ministry of Defence to approve the offer of the only bidder in the tender, the Belarusian 558 Aircraft Repair Plant. The submitted documents, show that the price offered by the company, for the repair of the Bulgarian Su-25 fleet, is EUR 159 million (VAT included), which is over BGN 261 million of the maximum price set in the tender, namely up to BGN 49.2 million (VAT included), providing an option for the stated amount to be increased up to BGN 99 million “if necessary” and with the Bulgarian Council of Ministers’ approval. According to the appointed committee, the Belarusian company can’t be dismissed for their high price offer, by referring to the requirements of the tender, in which it is not explicitly said that the stated estimated cost is the maximum one. As a maximum price in the procurement documents, is defined the one, that can be spent by the contracting authority, after an approval of the Council of Ministers, a fact that does not obstruct the next phase of the procedure but supposes that the Bulgarian Air force could only repair half the of the Su-25 aircraft fleet. Considering that the Su-25 repair procurement has been formed as a framework agreement, with specific orders allocated over 4 years, below the threshold of BGN 100 million, which is the maximum amount that can be spent without the National Assembly approval, the bid of the 558 Aircraft Repair Plant formally meets the requirements. Parliament’s approval will not be necessary either. Bulgaria’s Defence Ministry said it has managed to negotiate a significant price reduction, but it only practicable if the aircraft is repaired in their entirety, not partially, and excluding the supply of components and spare parts. According to the Bulgarian Defence Minister Krassimir Karakachanov there are no irregularities in the procedure and he approves the signing of a framework agreement with the Belarusian plant. This raises suspicions that, the case is perhaps to be circumvented the embargo imposed against Russia over its annexation of Crimea. It also became clear that the Su-25 overhaul could not be awarded to the Bulgarian state-owned company Avionas because obtaining the necessary license from Russia would take years. The award of the overhaul contract coincided with the government’s the draft budget announcement for the following year. It turns out, that no funds are provided for the acquisition of the new fighter, which somehow suggests that the money in question is redirected to the program for the old Soviet Union Su-25 repair. 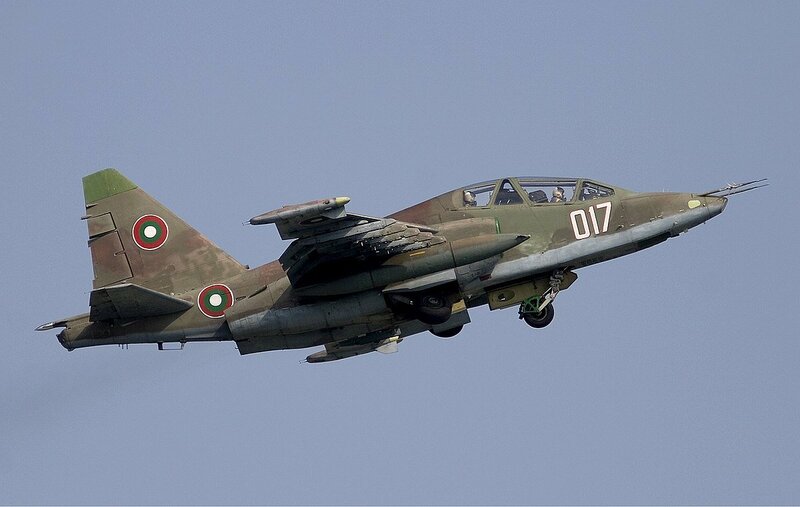 Update – Bulgarian Ministry of Defence Press Release – In relation to the published information in the media about the overpriced repair cost of the Su-25s, today, the Defense Ministry released an official statement saying that the aircraft could be repaired, but not for BGN 310 million (including VAT), as it is stated in the media, and for BGN 41 million (excluding VAT). The increasing of the amount up to BGN 82.5 million (without VAT) is not excluded as an option, but MoD emphasizes the fact that this could happen if the government approves. The statement clarifies that the procedure itself is negotiable and the exceeded price of BGN 310 million (including VAT) in the media publications, has not been negotiated at all. The Department recalls that the procurement concerns signing a framework agreement, which means that specific repair work will be ordered only when necessary and in financial capacity. On the speculations about the selected contractor, the Bulgarian Ministry of Defence adds that according to a survey of Air Force experts, only the Belarusian and Russian plants can carry out such overhaul, therefore the representatives of both companies were invited to take part in the tender. And the submitted documents of the only bidder – the Belarusian 558 Aircraft Repair Plant includes the full range of repair and modernization services for this type of aircraft, from which the Department of Defense will choose the most needed for our Su-25s.